HomeNew CarsNews#2015GenevaMotorShow: Honda Reveals the Most Brutal Civic Type R! The most powerful red ‘H’ badged 2015 Civic Type R packs 310 PS and 400 Nm of torque, the engine burst the Type R from 0-100 kmph in 5.7s before hitting a top speed of 270 kmph! Honda has revealed the production spec Civic Type R and the public debut will be held at soon to begin 2015 Geneva Motor Show. The red headed maniac will go on sale across Europe starting this summer. Apart from looking the most devilish Civic Type R ever with meaner LED styling, massive rear wing and purposeful body extension; it also sports Honda debutant VTEC turbo engine. Honda has revealed the specs of their anticipated debutant VTEC turbo engine, the 2.0-liter VTEC turbo 4-banger expels 310 PS at 6500 rpm with the peak torque of 400 Nm extracted at 2500 rpm. The power is sent to front wheels via a slick-shift six-speed manual transmission. The powertrain rockets the Civic Type R from naught to 100 kmph in 5.7 seconds. Honda says this makes it the fastest accelerating performance front-wheel drive hatchback. Moreover, the automaker adds that the Civic Type R, when under development, achieved a top speed of 270 kmph. 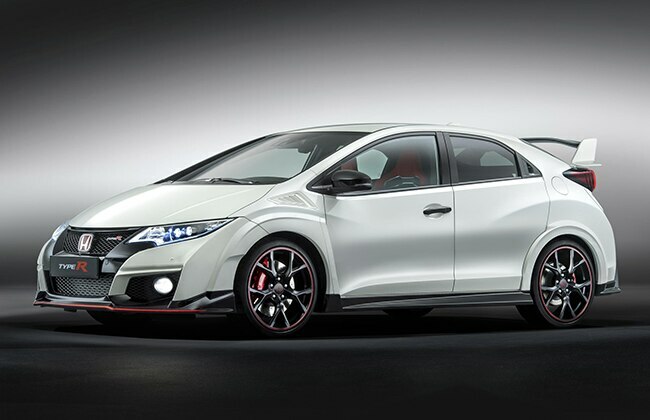 For braking, Type R features bespoke high performance Brembo brake package. The front wheel features four-piston calipers with 350 mm drilled discs riding on 19-inch radials. 2015 Civic Type R also debuts new ‘+R’ button! The new Civic Type R introduces a new ‘+R’ button for the future Type R vehicles. The ‘+R’ is just any other sports or sports+ button found on performance oriented vehicles. Honda says that by pressing the +R button it increases the responsiveness of the chassis and the drivetrain systems. The electronic power steering reduces its assistance for improved driver input and engagement. The new four-point Adaptive Damper System increases the damper force by up to 30 per cent. And at last the engine behaves vigorously with enhanced torque curve.